In the bowl of a stand mixer, combine flours, sugar, salt, powdered milk and instant yeast. Add butter and water and, using the paddle attachment, stir to combine. Pour dough on a lightly floured countertop and knead until soft and elastic, about 10 minutes. Dough will be slightly tacky, but not sticky. Pour dough into a lightly greased bowl, cover and let rise until doubled, about 1 1/2 to 2 hours. Remove the dough from the bowl and press it by hand into a rectangle about 3/4 inch thick, 6 inches wide, and 8 to 10 inches long. Form it into a loaf by working from the short side of the dough, rolling up the length of the dough one section at a time, pinching the crease with each rotation to strengthen the surface tension. It will spread wider as you roll it. Pinch the final seam closed with the back edge of your hand. Place the loaf in a lightly greased 8 x 4-inch loaf pan, the top misted with cooking spray and covered loosely with plastic wrap. Let rise about another hour to 90 minutes, or until the dough rises above the lip of the pan. Place the bread pan on a sheet pan and bake for 30 minutes. Rotate the pan 180°F and continue to bake 15 to 30 minutes, until a golden brown and about 190°F inside. Allow to cool completely on a cooling rack before slicing or serving. 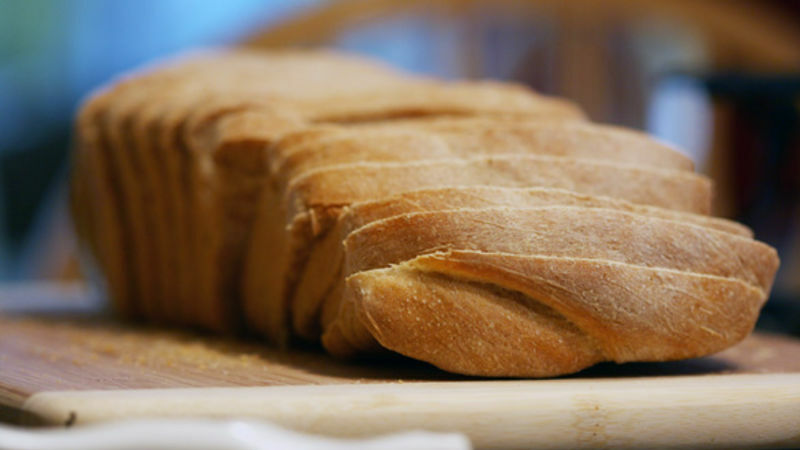 If you have been looking for a bread recipe to use as an “everyday” sandwich loaf, look no further. You’ve come to the right place. This Light Wheat Bread was an epiphany for me. Throughout my bread baking adventures, I always thought, “There’s no way I can make a loaf that looks and tastes exactly like the ones you buy at the store. They put magic in there. And I don’t have any of that in my kitchen.” After making this recipe, I realized how dead wrong I was. I did have magic in my kitchen, right here in this nifty little bread. And now, you can, too! I realize this isn’t a 100 percent whole-wheat loaf, and I too mourn this fact. The reason it’s not all wheat: without the addition of a little bit of high gluten flour (like bread flour), the bread doesn’t always rise as nicely as you’d want it to. Trust me, I’m working on making a whole wheat loaf that looks as beautiful and is as simple to make as this one! And when I find it, you’ll be the first to know. For now, this bread is a perfectly acceptable substitute, and for what it might lack in full wheaty-ness, it makes up in flavor and texture. It’s airy, mildly sweet, and though it contains whole wheat flour, it doesn’t retain that bitter wheat taste. Plus, it’s tall and dense – perfect for sandwiches. Perfect as an “everyday” loaf. The fact that it takes little effort and a couple hours of your time to make doesn’t hurt, either!